In Part 8.1, we went over how the Census ftp site was set up and what kind of data each directory has in it. 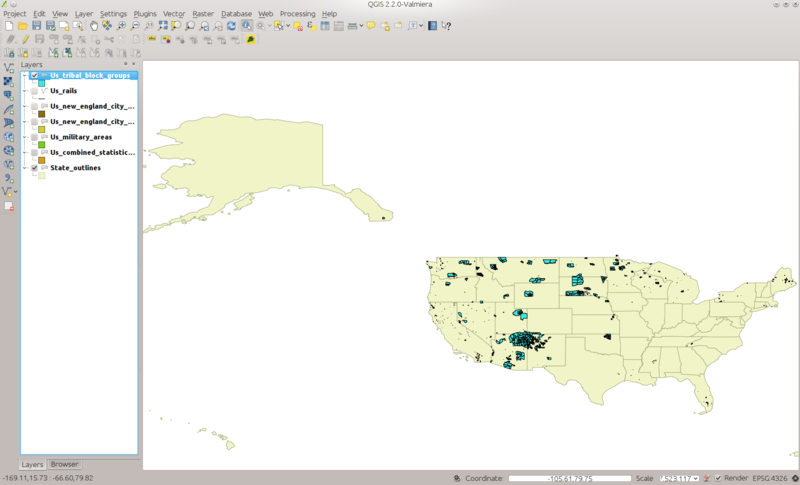 We also loaded our first Census data, which were outlines of the US states and territories. In this installment, we will load all the national files on the Census FTP site. These are all individual files so will be easier to load. Next time we will look at using scripts to convert the rest of the county-based data into state-based datasets. We are not going to download everything on the Census website. Some of the data you will likely never need. However, once these articles are done you should be able to download and create tables from the other data directories should you decide you need them. 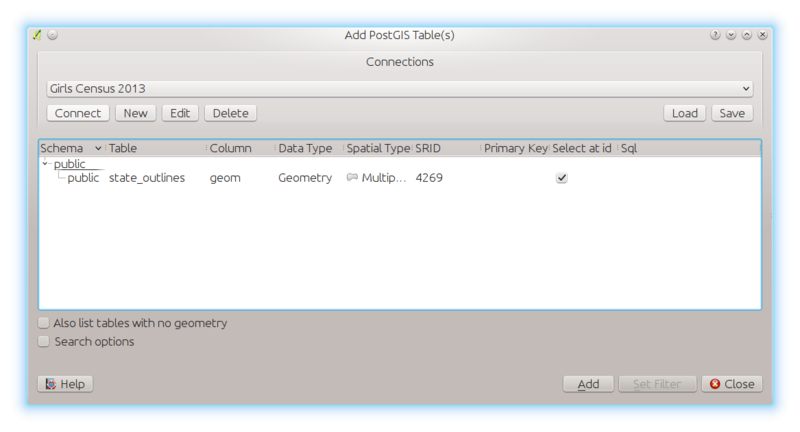 After each load, I will show a screen shot of how the data table looks inside QGIS so you can make sure everything loaded properly. This gives you a good number of files to add to your database for this part of the series. Type quit or hit Control-D to exit lftp. Your command will look similar to the following output. Here I am running the import commands on the same server that is hosting the database. "county_outlines_gid_seq" for serial column "county_outlines.gid"
Next change to the AITS directory. This is the American Indian Tribal Subdivision dataset. It contains information similar to the AIANNH dataset. Since the technique should be familiar now, here are the commands to run and their output. Again, substitute the specific values applicable to your setup. NOTICE: CREATE TABLE will create implicit sequence "us_indian_tribal_subdivisions_gid_seq" for serial column "us_indian_tribal_subdivisions.gid"
NOTICE: ALTER TABLE / ADD PRIMARY KEY will create implicit index "us_indian_tribal_subdivisions_pkey" for table "us_indian_tribal_subdivisions"
NOTICE: CREATE TABLE will create implicit sequence "us_alaska_native_regional_corporations_gid_seq" for serial column "us_alaska_native_regional_corporations.gid"
NOTICE: ALTER TABLE / ADD PRIMARY KEY will create implicit index "us_alaska_native_regional_corporations_pkey" for table "us_alaska_native_regional_corporations"
NOTICE: CREATE TABLE will create implicit sequence "us_metro_micropolitan_statistical_areas_gid_seq" for serial column "us_metro_micropolitan_statistical_areas.gid"
NOTICE: ALTER TABLE / ADD PRIMARY KEY will create implicit index "us_metro_micropolitan_statistical_areas_pkey" for table "us_metro_micropolitan_statistical_areas"
Now change to the CD directory. This dataset contains the 113th Congress Congressional districts. NOTICE: CREATE TABLE will create implicit sequence "us_113_congress_districts_gid_seq" for serial column "us_113_congress_districts.gid"
NOTICE: ALTER TABLE / ADD PRIMARY KEY will create implicit index "us_113_congress_districts_pkey" for table "us_113_congress_districts"
Now we move to the CNECTA directory. This dataset is the Combined New England City and Town Areas dataset. 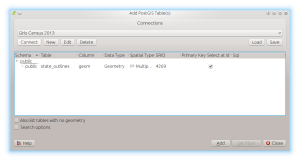 NOTICE: CREATE TABLE will create implicit sequence "us_combined_new_england_city_town_areas_gid_seq" for serial column "us_combined_new_england_city_town_areas.gid"
NOTICE: ALTER TABLE / ADD PRIMARY KEY will create implicit index "us_combined_new_england_city_town_areas_pkey" for table "us_combined_new_england_city_town_areas"
Next we move on to the COAST directory. This is the US Coastline data derived from Census edges. 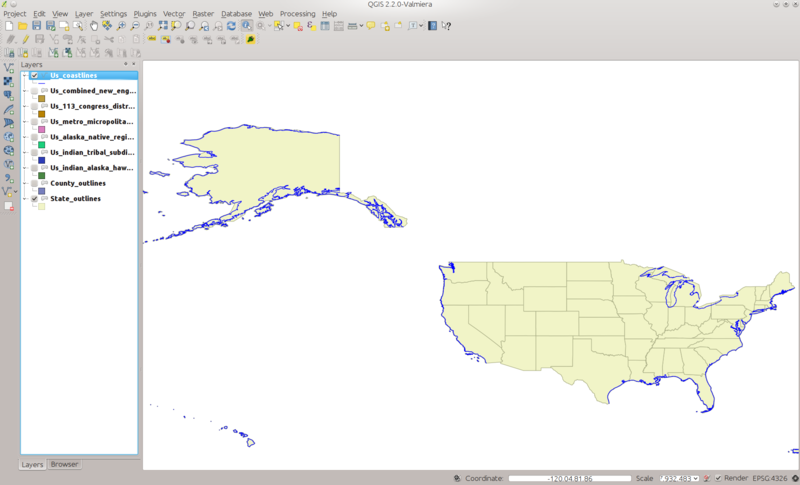 NOTICE: CREATE TABLE will create implicit sequence "us_coastlines_gid_seq" for serial column "us_coastlines.gid"
NOTICE: ALTER TABLE / ADD PRIMARY KEY will create implicit index "us_coastlines_pkey" for table "us_coastlines"
We now move to the CSA directory, which holds the combined statistical area national-level shapefile. These are generally areas where several large cities are combined into a single statistical unit, such as the Branson-Springfield area in Missouri. 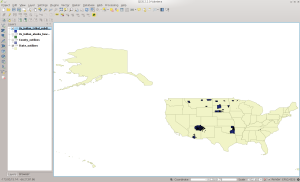 NOTICE: CREATE TABLE will create implicit sequence "us_combined_statistical_areas_gid_seq" for serial column "us_combined_statistical_areas.gid"
NOTICE: ALTER TABLE / ADD PRIMARY KEY will create implicit index "us_combined_statistical_areas_pkey" for table "us_combined_statistical_areas"
The MIL directory contains areas that are classified as belonging to the US Military… that we know about at least. NOTICE: CREATE TABLE will create implicit sequence "us_military_areas_gid_seq" for serial column "us_military_areas.gid"
NOTICE: ALTER TABLE / ADD PRIMARY KEY will create implicit index "us_military_areas_pkey" for table "us_military_areas"
Now to NECTA, which is the New England City and Town Areas. NOTICE: CREATE TABLE will create implicit sequence "us_new_england_city_town_areas_gid_seq" for serial column "us_new_england_city_town_areas.gid"
NOTICE: ALTER TABLE / ADD PRIMARY KEY will create implicit index "us_new_england_city_town_areas_pkey" for table "us_new_england_city_town_areas"
And the NECTADIV, which are the divisions in the NECTA dataset. NOTICE: CREATE TABLE will create implicit sequence "us_new_england_city_town_divisions_gid_seq" for serial column "us_new_england_city_town_divisions.gid"
NOTICE: ALTER TABLE / ADD PRIMARY KEY will create implicit index "us_new_england_city_town_divisions_pkey" for table "us_new_england_city_town_divisions"
RAILS contains, you guessed it, the national-level file of US railroads. NOTICE: CREATE TABLE will create implicit sequence "us_rails_gid_seq" for serial column "us_rails.gid"
NOTICE: ALTER TABLE / ADD PRIMARY KEY will create implicit index "us_rails_pkey" for table "us_rails"
Next is TBG, which are national-level Tribal Block Groups. NOTICE: CREATE TABLE will create implicit sequence "us_tribal_block_groups_gid_seq" for serial column "us_tribal_block_groups.gid"
NOTICE: ALTER TABLE / ADD PRIMARY KEY will create implicit index "us_tribal_block_groups_pkey" for table "us_tribal_block_groups"
UAC contains the Urban Areas from the 2010 Census. NOTICE: CREATE TABLE will create implicit sequence "us_urban_areas_2010_gid_seq" for serial column "us_urban_areas_2010.gid"
NOTICE: ALTER TABLE / ADD PRIMARY KEY will create implicit index "us_urban_areas_2010_pkey" for table "us_urban_areas_2010"
Next we will do the PRIMARYROADS dataset, which can be thought of as basically major US Interstates. NOTICE: ALTER TABLE / ADD PRIMARY KEY will create implicit index "us_primary_roads_pkey" for table "us_primary_roads"
And finally (yes FINALLY! ), the ZCTA5 dataset, which is the list of US zip code tabulation areas. NOTICE: CREATE TABLE will create implicit sequence "us_zip_code_areas_gid_seq" for serial column "us_zip_code_areas.gid"
NOTICE: ALTER TABLE / ADD PRIMARY KEY will create implicit index "us_zip_code_areas_pkey" for table "us_zip_code_areas"
So that is it. You now have the US state borders, county outlines, and a large amount of national-level data such as railroads and interstates. 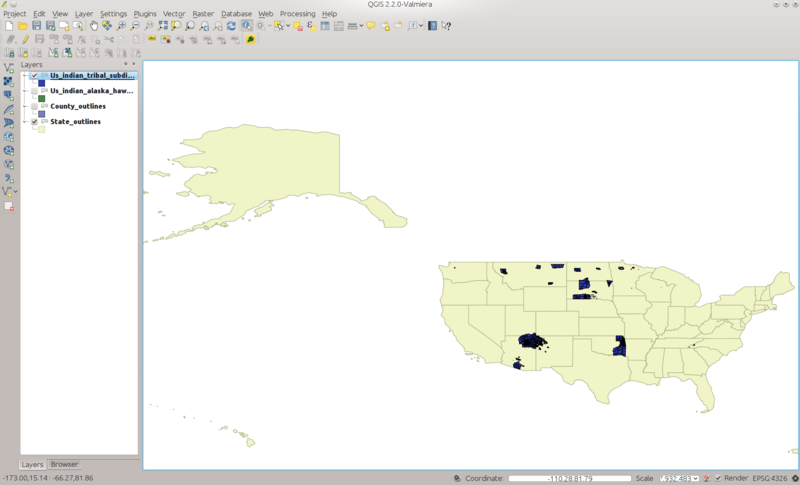 In 8.3 we will tackle some of the other datasets that are comprised of multiple county files for each state. 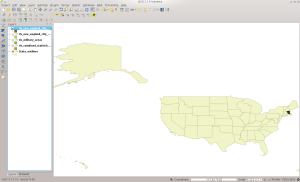 We will convert them to single state files and then import them into PostGIS. Until then, examine and experiment with what you have just done and see what data is actually inside the tables. We have finally gotten past the preliminaries, and this series now takes a turn towards what free geospatial data is available and how you can make use of them in free tools. 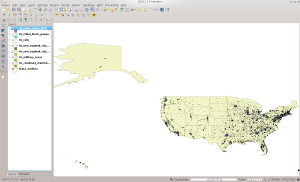 The rest of this series will focus heavily on putting data into a geospatial database, PostGIS in this case. I will also be posting various bash scripts that I have written to make things easier when staging data for import. Many of the datasets are megabytes and gigabytes in size. Trying to use them as a series of files would be slow and very inefficient. The whole reason people started putting data into geospatial databases is they wanted to use the ability to localize data and use relational query syntax to speed up fetching data. Geospatial databases can physically store data that is spatially near each other in the same locations on disk, commonly called clustering. 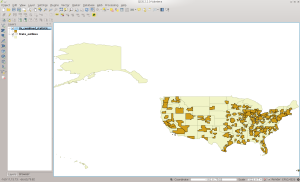 Spatial indexes can be created that makes it easier for the database to locate information. Combine this with a query that only requests a subset of the data and suddenly you can manipulate large datasets with ease. “Why would I want to make my own databases when I have Google?” you might ask yourself. You can only get so much out of Google Maps for free. If you make a lot of use of their servers, or if you use it for commercial purposes, you will have to pay. 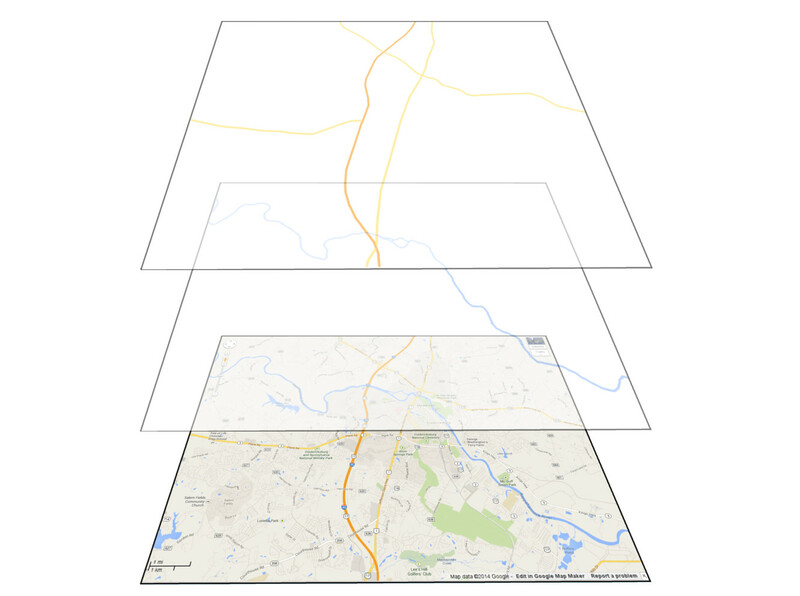 Map data you get back are pre-rendered raster tiles using their styling. Even OpenStreetMap serves up raster tiles already styled. You could use a lot of traffic going back and forth to their servers. If your bandwidth is metered, this could increase your out-of-pocket costs. If you store the vector data yourself, you have access to the original data that was used to make up the raster tiles from Internet sources. You can do a lot with this type of information, from accurately measuring line segment distances to geolocating street addresses. More importantly, you have access to all the metadata that is in the vector data. You can get more than just a name about a point or area: you can find out who collected that point, when it was collected, and in some cases even who owns a point or area. You can style the data however you want. You can impress all your GIS geek friends. And best of all, you can use it as much as you want without having to pay anyone else. This post is a bit of a foreshadowing of what is to come. I will provide pointers to the various datasets that will be covered. The idea is that you can read ahead and get a feel for what kinds of information each dataset contains. You might even be amazed at how much is out there. The first dataset we will cover is the US Census Bureau’s Topologically Integrated Geographic Encoding and Referencing (TIGER) Dataset, which for US citizens is the granddaddy of them all. 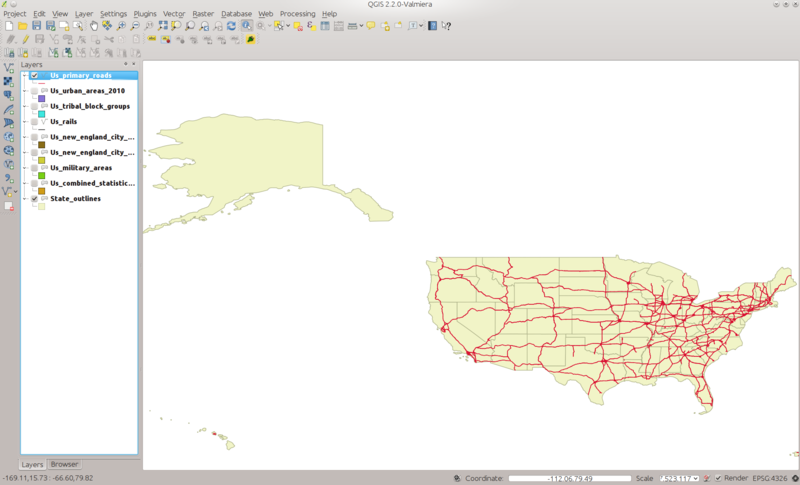 This dataset has been released since the 1990’s and is one of the original base datasets for OpenStreetMap in the USA. TIGER currently contains a large amount of metadata for each road segment such as left and right street address ranges, what zip codes they are in, and so on. Next are the data from the OpenStreetMap project. This project was created in 2004 in the UK and has grown to include crowd-sourced data worldwide. It is maintained by volunteers and in many cases is more up to date than many traditional data source. Volunteers can contribute GPS traces or collect data off of aerial photography. In additional to roads, this dataset contains a huge amount of points of interest and trails. The Natural Earth dataset is a public domain collection that is available at scales of 1:10m, 1:50m, and 1:110m. While not as comprehensive as OpenStreetMap, this dataset contains raster and vector data along with associated metadata. It also contains shaded relief maps that are combined with color-ramped elevation data derived from satellite imagery. It is maintained by the North American Cartographic Information Society (NACIS). Combined, these three datasets will take up quite a bit of space on your system. You should expect to need at least 30 gigabytes of space on your system, more depending on if you import all of OpenStreetMap or not. We’ll cover that in later installments of this series. 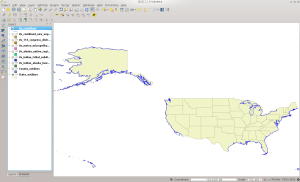 In the meantime, follow the links I’ve posted, play around with tools such as QGIS, and get a feel for how things work. Hit up the project web pages to learn more about the software and Google for more background if you’re coming into the GIS world fresh. 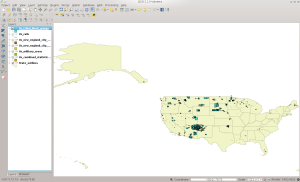 So in the last installment I mentioned that I would do another article on QGIS. However, after looking, there is such a large amount of documentation out there that I felt that I would just put links to some good online documents so I would not have to reinvent the wheel. So here are a few links you can use to learn how to use QGIS as these articles will make use of it later on once I go into how to build your own large holdings of free geospatial data. http://www.qgis.org/en/docs/index.html – The QGIS project itself has written up a large amount of very useful documentation on their website. I would suggest the User’s guide and then the A gentle introduction in GIS. 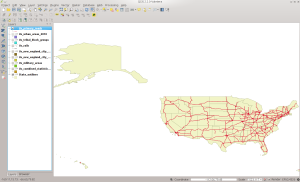 http://maps.cga.harvard.edu/qgis/ – This guide is hosted at Harvard University. While written for 1.7.3, the concepts are the same and gives a thorough howto for QGIS. 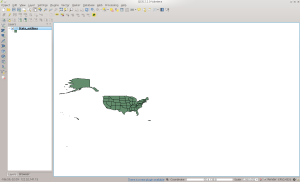 http://qgis.spatialthoughts.com/ – Quantum GIS (QGIS) Tutorials – This site has links on how to do various operations in QGIS. 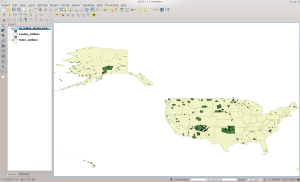 http://multimedia.journalism.berkeley.edu/tutorials/qgis-basics-journalists/ – QGIS basics for journalists – Another good howto for using QGIS. In addition to these, don’t forget to use your favorite search engine to look for QGIS tutorials. Youtube also has a lot of videos where you can watch, instead of read, how to use QGIS. Ok, I admit it. I did it this way because I’m feeling lazy since I’m sick and figure I would just point to other great tutorials so I can move on to importing data from various sources. I took a brief vacation so have not updated this in a while. Switched distributions from Fedora KDE Spin back to Kubuntu and had the holidays hit. Then ended up finding out Kubuntu 13.10 did not have the latest QGIS so had to compile the packages for it myself. But now it is time to get back into the swing of things. 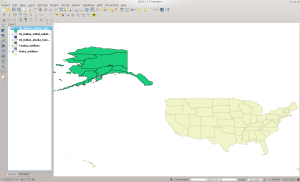 We last left off with setting up a geospatial database and putting a small sample Shapefile with a few points so you could get some experience with creating and storing data. However, now that the data is in the database, it would be handy to actually display it instead of just looking at the metadata about it. 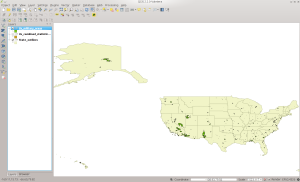 QGIS is one of the leading open source GIS tools in existence. It can call functions from GRASS to use advanced functionality that is not built-in. It has a Python-based plug-in system with an extensive set of plug ins that perform raster and vector operations in addition to allowing one to use data from Google and Bing as a base map. Put this all together, and you have something that these days can actually take on and surpass the commercial GIS offerings out there. Installing QGIS is very straight-forward these days. 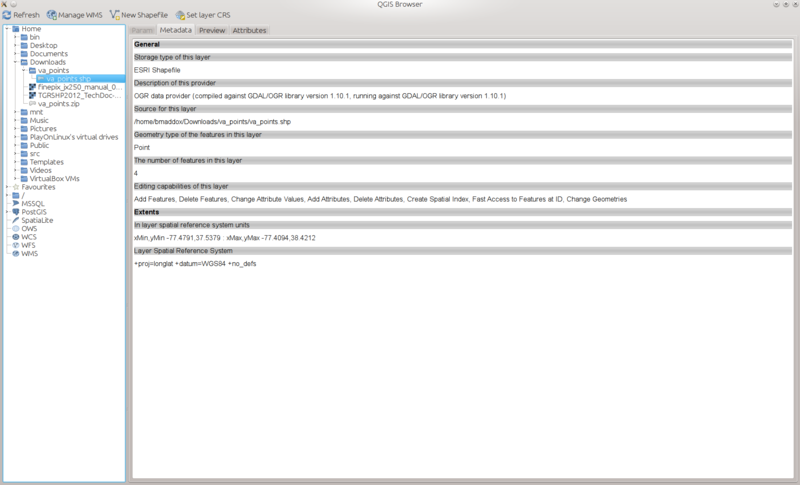 Windows installers can be found at the QGIS website that make use of Cygwin. 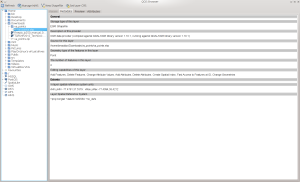 Most Linux distributions have packages pre-built in their repositories. If you are on Ubuntu, I would recommend that you ignore my previous post on this blog, as the Ubuntu-GIS team has built packages and placed them into the ubuntugis-unstable repository. Do not be fooled by the unstable moniker. I have been using packages from there over the years and have never had any issues with them. Check your distribution repositories and package search tools to find version 2.x for your system. 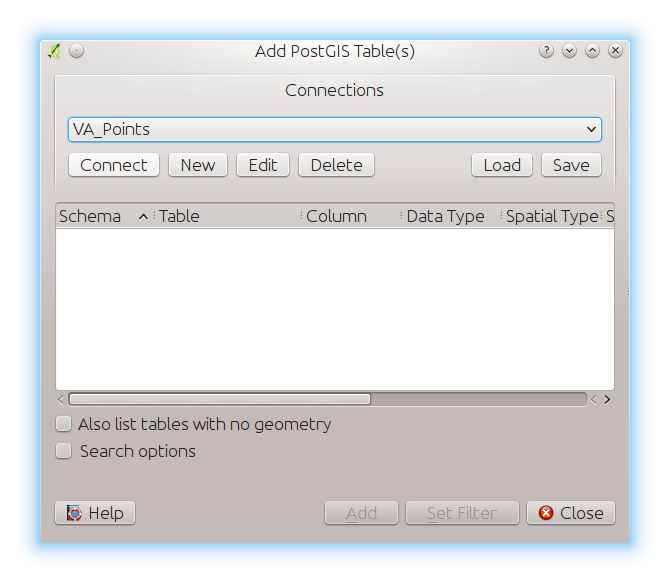 Once installed, you will find two different application shortcuts in your Windows/window manager’s menu: QGIS Desktop and QGIS Browser. 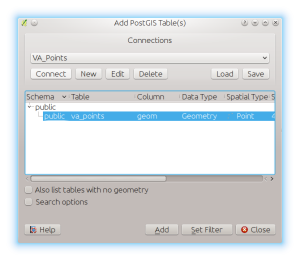 QGIS Browser is a tool dedicated to making it easy to browse through your geospatial database holdings, be it an ESRI geodatabase or PostGIS. For each layer or data file, you can examine the metadata, preview the file, or examine the attributes stored in the data. 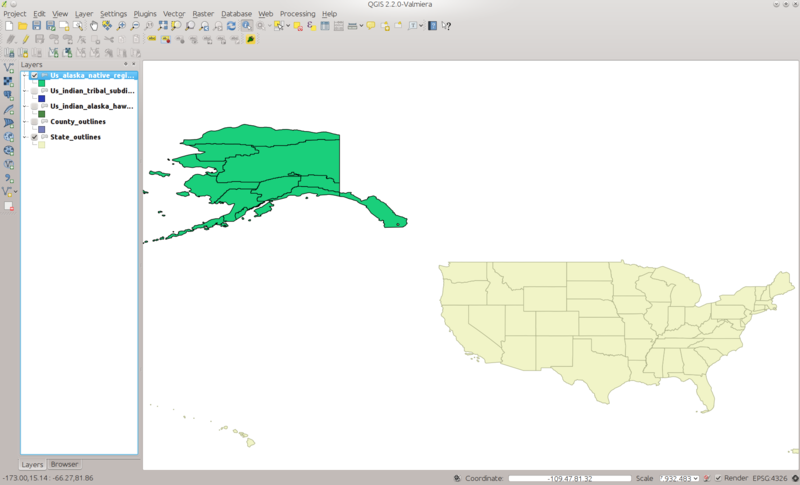 The browser was introduced around the QGIS 1.8 time line and is similar to ArcCatalog for the ESRI users in the crowd. 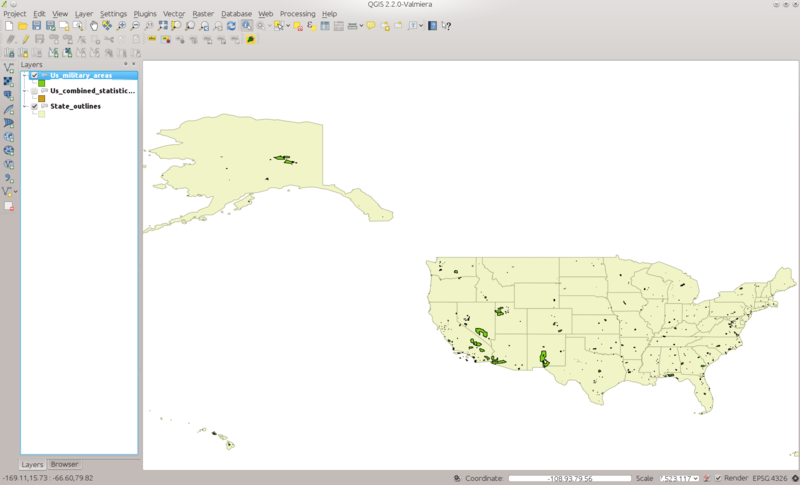 The main use for it is to quickly browse and examine your data without having to load it into QGIS proper. QGIS Desktop is the traditional GIS application that allows you to perform processing on your data in addition to visualizing and examining metadata. 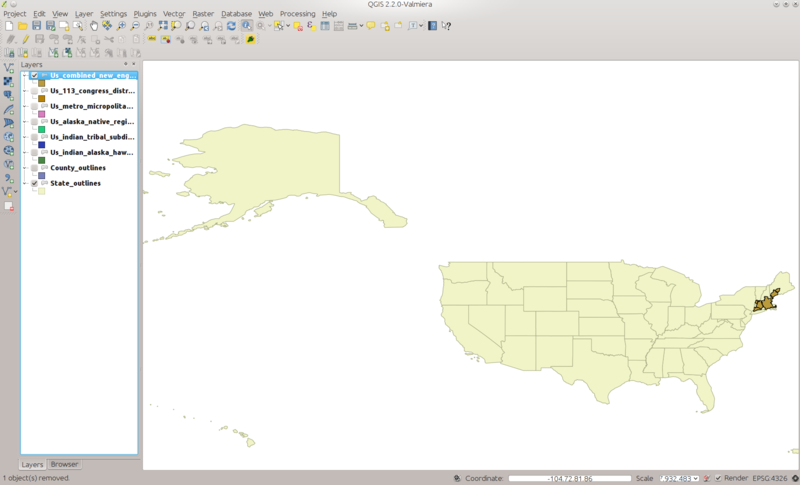 The default layout of QGIS is show below. 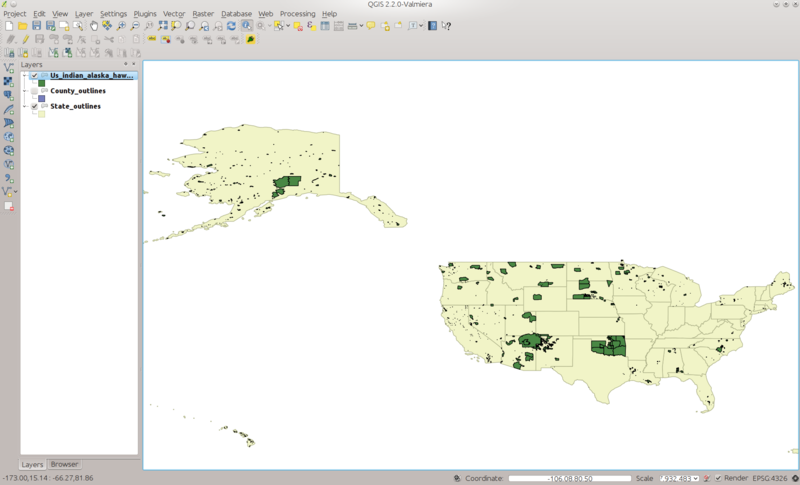 The QGIS 2.x layout differs slightly from the version 1.x layout. By default, along the left side of the window you will find the toolbar containing the add layers buttons for various types of data sources. 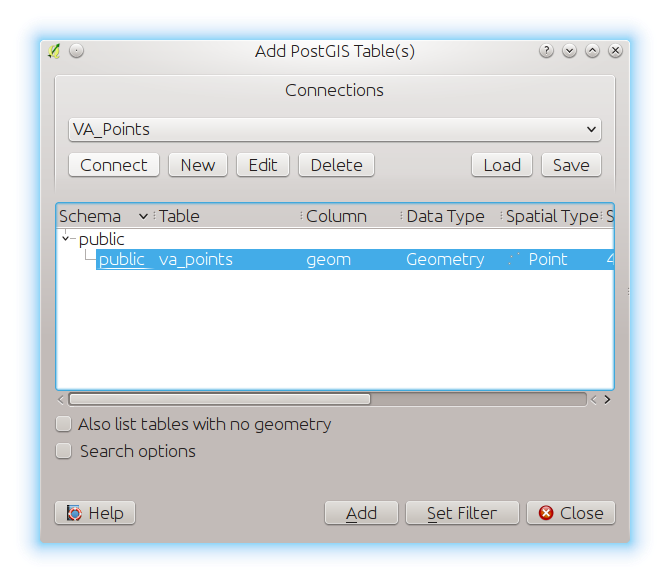 Next to that you will find a tabbed box that displays either the layers window or the browser built-in to QGIS Desktop. The browser here allows you to quickly find data that you can then click and add as a layer into the desktop application. Along the top of the window, you will find the application menus and toolbars for functions such as opening/saving files, zooming, measuring, and other functions. 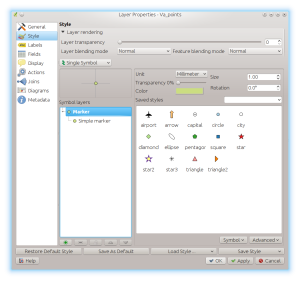 Depending on what plug-ins you have installed an activated, there could be additional menus and toolbars such as the GRASS layers and functions bar. 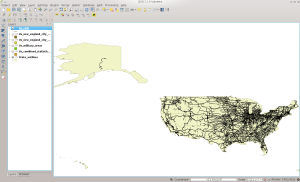 To use tools such as QGIS, you have to understand how such system work. GISs allow you to manipulate data based on the concept of a layer. Each layer represents a data set, be it raster (think aerial imagery) or vector (think points and lines that represent roads). At a minimum, these data sets are related to each other by their geographic area and temporal parameters. Inside the GIS, you can overlay the different data sets (layers) on top of each other. Usually, you will start with what is called a base map (think of the streets version of Google Maps) and then add more specific data sets on top of that. 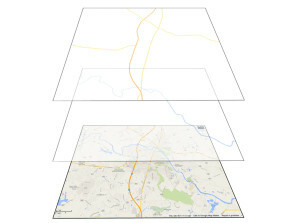 In the example below (which demonstrates my lack of artistic skills), you can see a Google Roads layer as the base map. Added to that is a river and then a road layer. 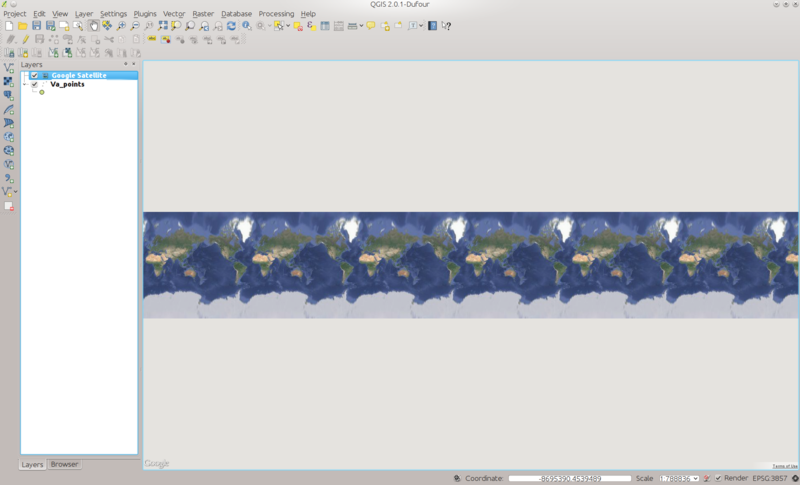 Inside the GIS, all of these layers would overlay on to the base map so that everything lines up (assuming it has been georeferenced properly). 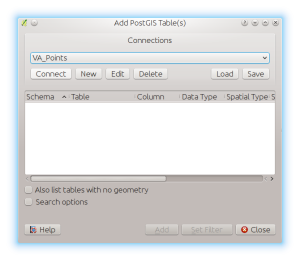 Now we will use QGIS with a base map and overlay the points that you put into your own geospatial database from the last installment. 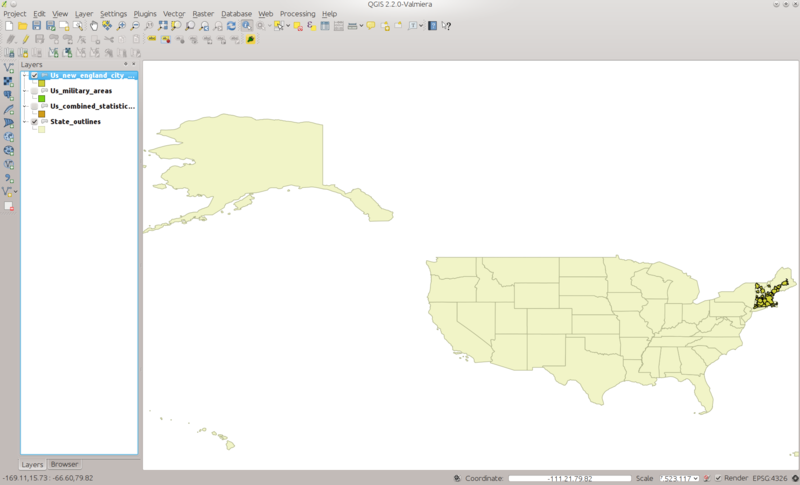 If you did not put the Shapefile into the geodatabase, you can also simply add it as I will illustrate below. 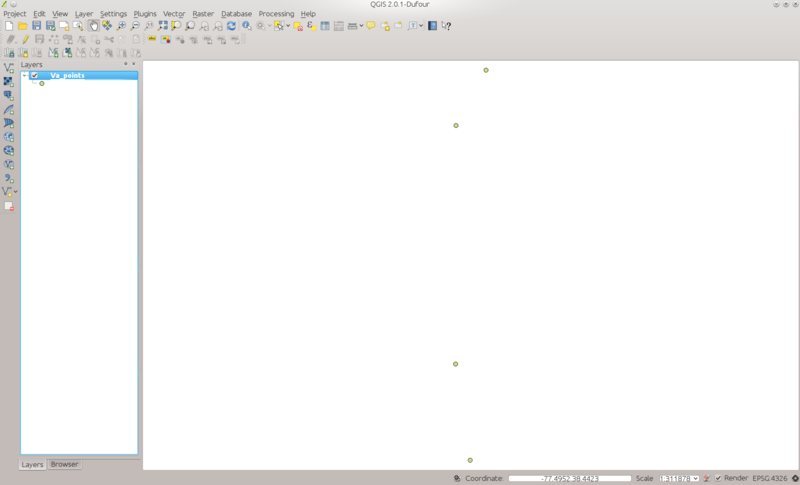 If you set up PostGIS and imported the file into it, start by clicking on the elephant-face icon as shown below. You will then be presented with the following dialog box. Click on the New button and fill out the information similar to the below figure but use your specific host, user, and database names. Click OK and then OK again if you chose to save your password like I did. 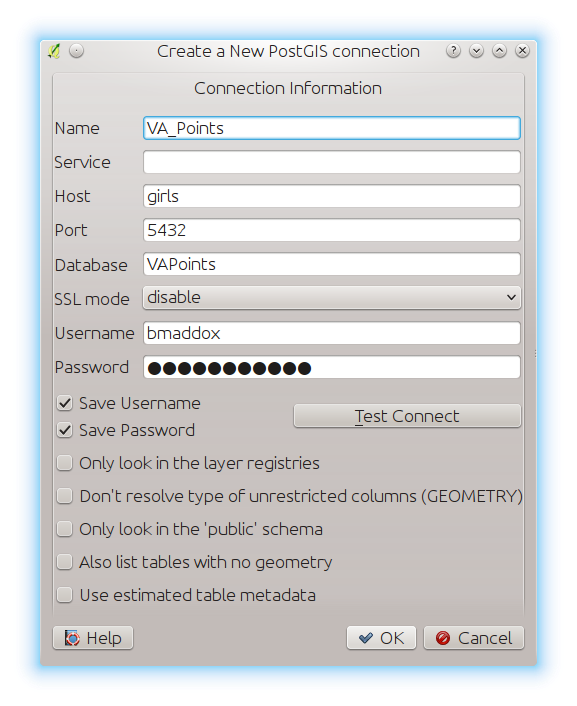 Then, with the VA_Points layer selected in the drop-down, click the Connect button. You should then see an entry under Schema called public. Click on it and you will then see your table name similar to the below figure. Select the points layer and then click the Add button to add this layer to QGIS. 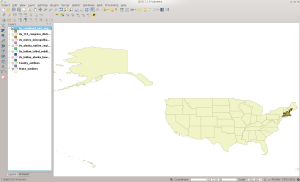 Your QGIS window should look similar to the below. If not, recheck your connection settings and try again. Note that if you just download the points layer, click on the Add Vector Layer button which looks similar to a V and is shown below. 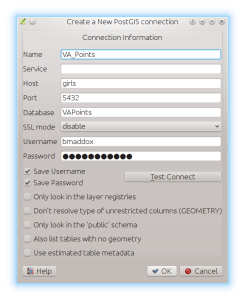 Click the browse button and select the va_points.shp file from the zip archive you downloaded and then click OK. Your screen should look the same as the above. Now that we have the points layer added, it is time to add a base map so that you can see how the data overlays. To do this, we will use the OpenLayers Plugin in QGIS to add a Google Maps satellite image. First click on the Plugins menu item and select Manage and Install Plugins. You will see a window similar to this one. If you see the OpenLayers Plugin listed in the Installed plug-ins section, click the check box next to it to enable it. If not, click on Get More tab and type OpenLayers in the Search box. Click on OpenLayers and then click Install to put it on your system. 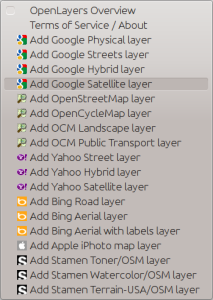 Now that OpenLayers is installed, click on Plugins again, click OpenLayers, and click Add Google Satellite Layer to add it to a new layer in QGIS. Once done, QGIS will look similar to below. Do not panic, we will fix it shortly. I specifically uses this sequence of steps in a work flow to demonstrate another GIS concept – the geographic extent. Geospatial data has an extent an a time associate with them. 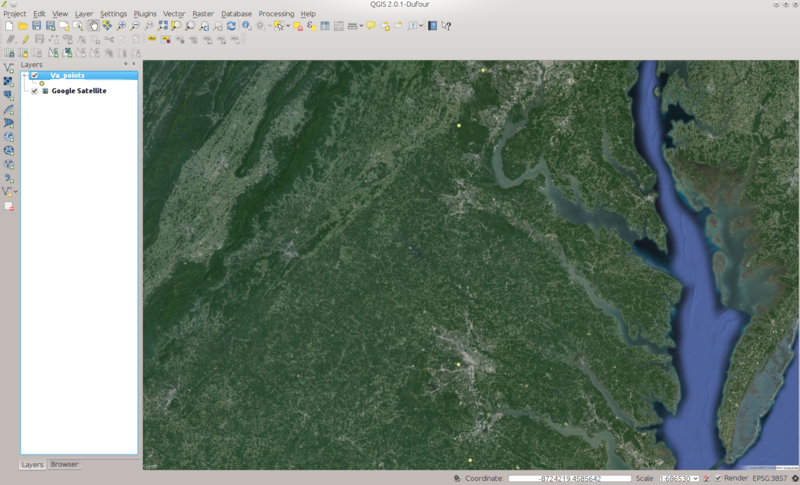 We first loaded the VA Points layer to set the geospatial extent to the area surrounding roughly the middle of Virginia. The extent on the screen is then based on how much you zoom in or out of the image. If you zoom in on a point, you are decreasing the geographic area (or extent) that is displayed on the screen. If you zoom out, you then increase it. If I had started with just the Google Satellite View, your extent would be as demonstrated in the image. You then would have had to add the points and then zoom down to where the points are located. However, as you can see from the above screen shot, when you add a layer using the OpenLayers plugin, it will default to a view such as above. It appears to be zoomed way out and you see multiple side-by-side images of the Earth. Plus, it is on top of your image. Fixing this is a very easy task. 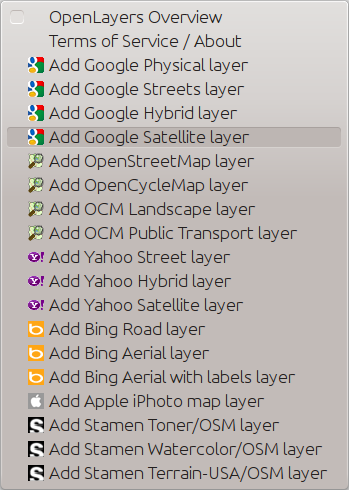 First, on the layers side window, notice that the Google Satellite layer is on top of the VA_Points layer. 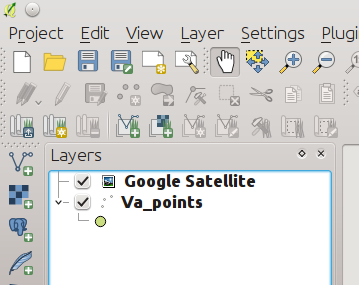 Click on the Google Satellite layer and drag it so that it is below the VA_points layer. Your screen will then look like this. 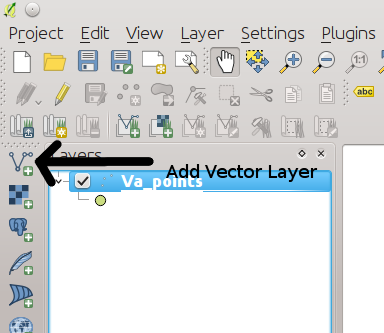 Now click on the VA_points layer and select Zoom to Layer Extent. This will redisplay all of the data so that it fits into the geographic area that the points layer covers. As you can see below, this also sets the Google Satellite layer to the same extent as the points layer so that the points and satellite layer are both referenced together. 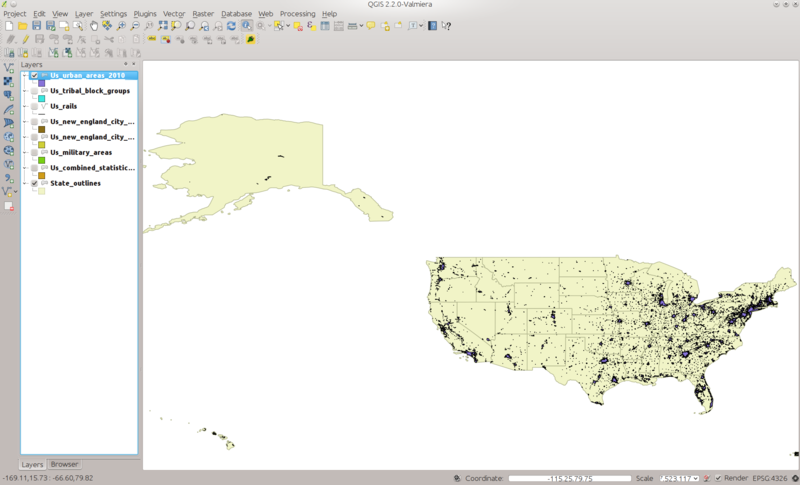 QGIS will select a random color for your points when you first add the layer. As you can see from the above screen shot, it choose a green on my system which does not stand out that well over the satellite image. You can double click on the green dot under the VA_points layer name to change the color. Double-clicking brings up the properties for the vector layer. The default should be to display the Style tab. From here you can change various properties to alter how the layer appears on the screen. You can select different symbol types, sizes, and other properties for each point. We will just be changing the color for this example. Click the color button to bring up the Select Color pop up. I selected a bright red from the Forty Colors drop-down for the points in this example. That’s it. You now have successfully loaded two different data sets into QGIS. As homework, find the zoom button in the top menu bar and zoom in to the areas around each point. You will see that you get more detail from the Satellite layer as you decrease the geographic area around each point. This is similar to how things would look if you were sitting on your roof looking at the ground versus looking at your house from the International Space Station. Since this post has already gotten very long, next time we will go through some of the other tools that exist inside QGIS, such as viewing metadata for a point and making measurements.